Jake, Marco, Rachel, Cassie, and Tobias are 5 ordinary children who one day come across an alien. The alien, an Andalite, came to earth in a crash landing with a warning of an impending invasion. The Yeerks, unstoppable mind-controlling slug-like aliens, are setting earth as their next target. 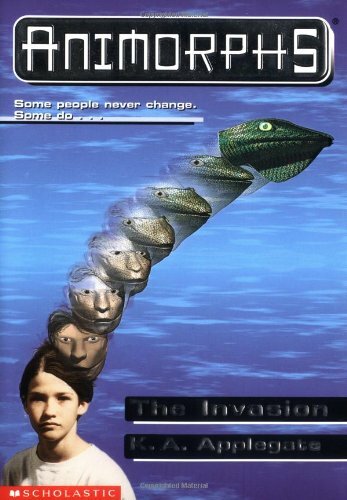 The 5 kids are given the power to change into animals in order for them to stop the vile creatures and take back their earth. But who can they trust? There’s something about this book that has me invested in the story from page one. Maybe it’s because the narrator (Jake, in this book) gives the story real weight in the way he tells it. Maybe it’s because the story is just cool and feels appropriately big and important given that it’s about an alien invasion. Really, while I was reading it, it didn’t FEEL like just a “kids book” in the same way something like Captain Underpants or even Goosebumps feel like kids books. It just felt like a really good story. And I believe that has partially to do with the great characters. The main kids in this book feel like some of the best characters in any kids book I’ve ever read. They do start off a bit one-dimensional, with the Funny Guy, the Leader, the Shy One, etc. However, they quickly grow out of those dimensions and flesh out very well. I can hardly imagine how much development they’ll go through in the rest of the 54 books in the series. The villains of the piece also feel like a legitimate threat. The worst part is that they could be anyone, which means that the kids have no idea who they can really trust. It gives them a good reason not to go to authorities with their information. This is just another example of how this book feels very well thought out. Although this is a definite Science Fiction piece, I still feel like it’s an appropriate title for my Reader Beware series. Why? Because it has a surprising amounts of horror elements. There’s the threat of the monsters with the evil alien slugs and their minions. There’s the mistrust of everyone causing the heroes to feel alone in their world. There’s a definite sense of danger as the kids try to figure out how to face the alien menace. They know they might die but they also know that they have no other choice but to fight back. If that all doesn’t scream horror, I don’t know what does. This is only the first of a rather long series. It DOES feel like the beginning of something big, too. The story is just getting started and I, for one, can’t wait to read the rest. I have the feeling I’m in for a fun, shocking, dramatic, and awesome time. If you’ve never read this series before (like I hadn’t), I seriously recommend giving it a read no matter what your age. After all, who among us HASN’T wanted to turn into an animal just to see what it’s like? This entry was posted in Books, Reader Beware by richard0211. Bookmark the permalink.